Another escalation, especially in Syria, is the present danger. That was the dark prophecy of the radical German playwright Bertolt Brecht, a former Santa Monica resident, written in the shadows of the Holocaust. 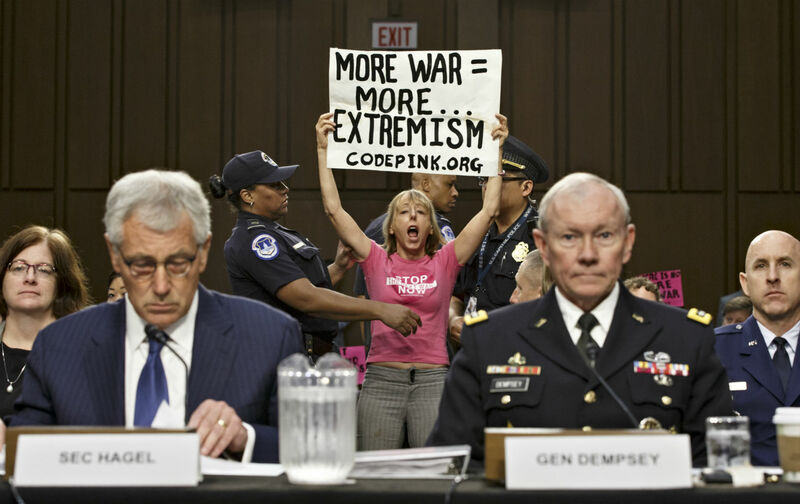 Today, in the 15th year of the Long War, an anxious America needs a peace-and-diplomacy platform from the Democratic Party convention but also, more importantly, a new, more effective peace movement. That’s a challenging order, given public anxiety over the war on terrorism and the need for a peace-and-justice alternative. Polls show a consistent majority in opposition to another ground war, with its attendant US casualties and budget deficits. On the other hand, Americans strongly support military intervention if it will defeat ISIS without spiraling into another futile war. and, in the general election debates, mobilizing against Trump’s Strangelovian fantasies of deploying nuclear weapons in South Korea and Japan. In the campaign—and, if Hillary Clinton wins, during her presidency—Senator Bernie Sanders’s legions should be outspoken against regime change and demand that a new peace-and-diplomacy bloc be forged in Congress. The threat of nuclear brinkmanship and war can stir the anger and questioning of a new peace movement, as happened in 2003 before the Iraq War. Later, as it became clear the war was unwinnable and unaffordable, this new peace movement mounted political pressure, with demonstrations in the hundreds of thousands on more than ten occasions. Led by Representative Maxine Waters and a growing number of congressional dissidents, this movement became the backbone of popular resistance, from the streets to congressional suites. That movement helped propel Barack Obama in the 2008 presidential primaries, as Hillary Clinton well remembers. The organizers demanded that goals and timetables be set for American withdrawal, forcing the return home of 90 percent of US troops—until the resurgence of Sunni-Shia sectarianism helped the rise of ISIS and forced the United States down the path of drone warfare, redeployment of Special Forces, and even some ground troops. Another escalation is the present danger. Until the balance either on the ground or in American politics shifts again, we could sink into a new Dark Age. Bernie’s legions should be outspoken against regime change and demand a new peace-and-diplomacy bloc in Congress. The real choices now are between a limited and secretive US war against terrorism, which at least preserves most of the New Deal legacy of Social Security, community colleges, and public schools, on the one hand, and expanded funding of Medicare, Medicaid, and Obamacare, including a revived public option. The fight to save the planet from fossil fuels will lead to a final showdown with Big Oil and the denying, lying fundamentalists. The Republicans are gnashing their teeth to destroy those vital social programs during their march to war. The war-presidency model of Franklin Roosevelt could be the best-case scenario for a renewed peace struggle in the midst of new opportunities for labor, environmentalists, and communities of color. Someone like Representative Barbara Lee will revive a peace-and-diplomacy caucus in the Democratic Party, either as a new leverage point or an extension of the existing Congressional Progressive Caucus. Along with President Obama and Senator Sanders, Lee is pushing hard for a new Authorization to Use Military Force against ISIS, with important incentives for diplomacy and fixed limits on US ground troops. Only the exhaustion of sectarian parties representing Saudi Arabia and Iran will lay the conditions for a stable peace in Syria. As the major powers and their proxies continue bleeding, peace advocates should keep urging a political settlement, including a possible partition. The absence of a peace presence in the Democratic Party and in the streets is the vacuum that needs filling. The left needs to fight on defense until November, while at the same time debating and deciding how to break through this paralysis. A Democratic triumph in November will elicit a rush of relief and new energy looking forward. If Trump continues to falter, the Republicans may break from their insane fundamentalism, if only to save their prospects in November and after. If the GOP crumbles, new options may be floated on immigration reform, government spending, climate denial, and so on. But the prospects for ending the Long War will remain dim. Preserving the US-Iran nuclear agreement, the US-Cuba rapprochement, and support for the Cuban-sponsored peace agreement in Colombia—including an end to the Drug War—are the red lines progressives must draw. The fight against neoliberalism at home meshes with the fight against liberal interventionism abroad. A Democratic triumph in November will elicit a rush of relief and new energy looking forward. If Trump is defeated and Democrats win eight or 10 Senate seats, the challenge of building a new Democratic left, inside and outside the party, could lead to a new era of optimism—and a more liberal Supreme Court for the next decade or longer. We would see renewed hopes for rebuilding a progressive bloc within a liberal party, as well as new single-issue movements with access to power such as we’ve never seen before. As Sanders says prophetically, “the struggle continues,” forward to a social-democratic party with an egalitarian foundation built on the extraordinary scale of Bernie’s presidential campaign. An opening toward a center-left political spectrum will open space for many possibilities.